You may have noticed I've taken a long break from root vegetables, even though it was wintertime. I made a few too many soups and sides of roasted butternut squash last fall and by mid-December I'd had enough. I took advantage of the warm winter to eat vegetables we don't usually get in February and avoided squashes and sweet potatoes. They felt too heavy in my tummy! The Monkey Scientist, to be honest, wasn't all too pleased with my boycott. He likes his root veggies! 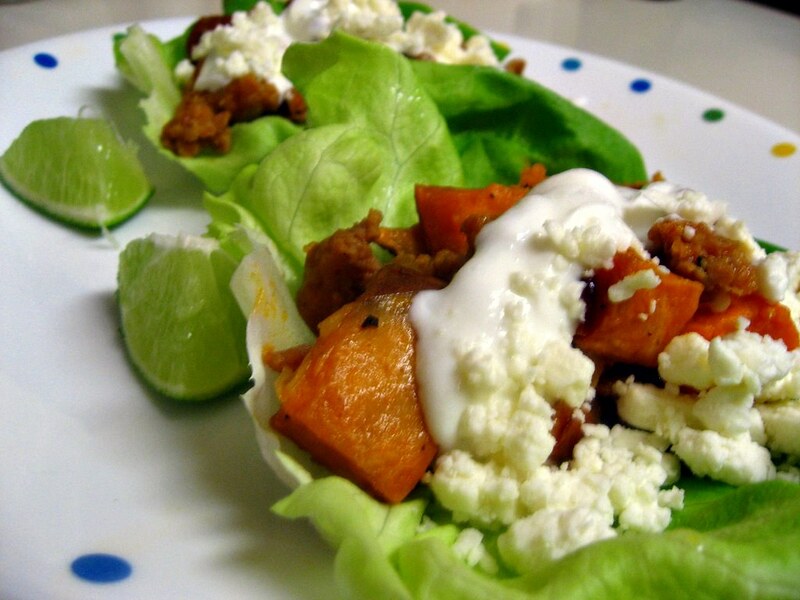 So when this recipe came around for sweet potatoes used in a light and refreshing way, I jumped on it. I'm slowly letting the root veggies back into my kitchen. The fact that this recipe included perhaps our favorite ingredient - chorizo sausage - certainly didn't hurt its cause. Usually I save recipes for the backburner, but this one I saw and printed immediately to make that night! The first thing I loved was the roasted corn. I'd never think to roast corn! In the summers we have always eaten tons of corn on the cob, and I love it in salad and cornbread, but that's about the extent of my uses for corn. Now that I realized how easily I can roast frozen corn, I want to try it in all sorts of new dishes - pasta, wraps, sandwiches! The possibilities are endless! I also want to mention this little juicer. It was a Christmas gift from one of my mom's best friends and I love it! I'm the queen of dropping lemon/lime seeds into whatever I'm cooking, but this catches all of them, along with the pulp. It's totally fantastic and I recommend you pick one up if you ever juice citrus for cooking. You may have noticed I slashed the cilantro from the original recipe. If you follow this blog, you know it's because I think cilantro tastes like soap and no one should ever have to eat it. Of course, if you disagree, just ignore me. I guess you could add cilantro to the yogurt sauce, the filling, and added back on top of each wrap. But don't expect me to eat it if you do! Blech! This was such a yummy dinner. It had so many flavor components. The potatoes and corn add earthy sweetness, but with a bit of spice from the cayenne. The chorizo is spicy but is sweetened by the caramelized onions. Then everything is cooled down by the yogurt sauce and feta, which is tangy and fresh. 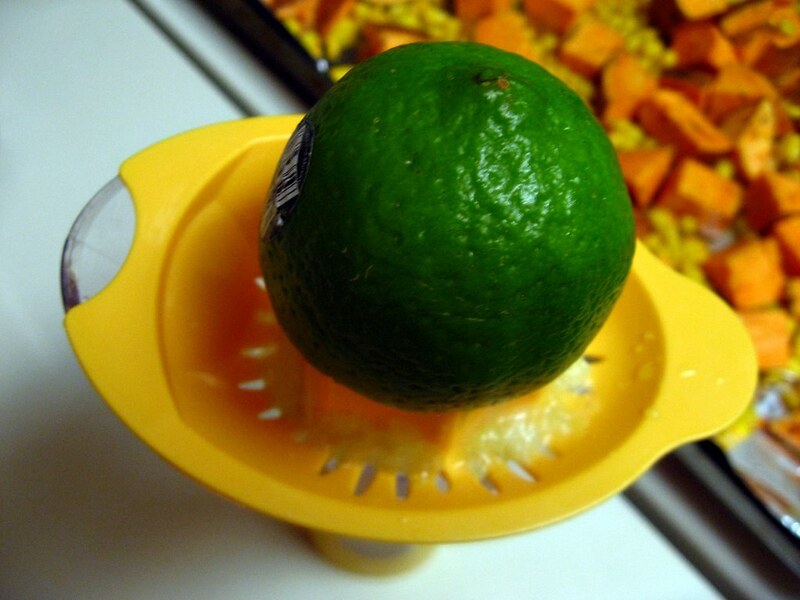 Finally, the lettuce and extra lime juice add the perfect bit of citrus. This is an absolutely fantastic meal! 1. 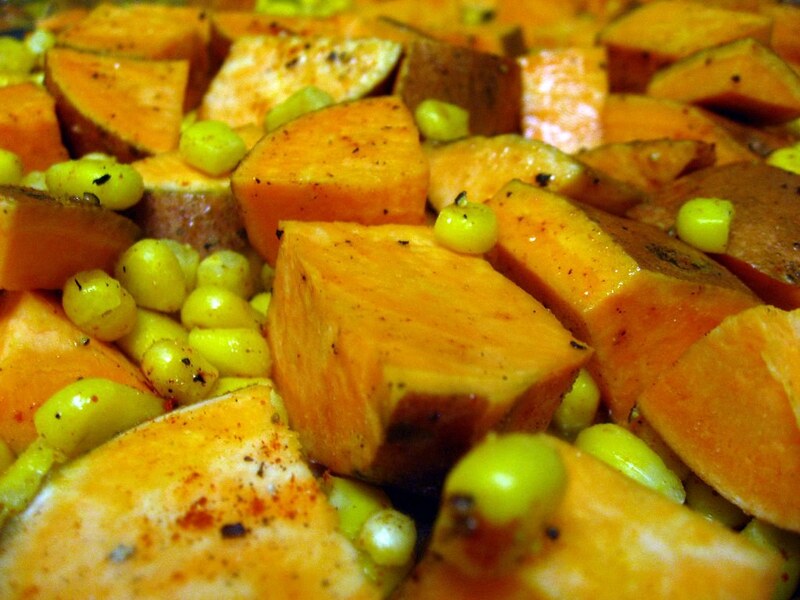 Preheat the oven to 450 degrees F. On a foil rimmed baking sheet, toss the sweet potatoes and corn with 2 tbsp olive oil, cumin, cayenne, and salt. Spread everything evenly across the plate and roast 15-20 minutes, stirring every 5-10 minutes, until potatoes are tender and there are brown spots on the vegetables. 2. When the vegetables are finished, set aside. Then, heat 1 tbsp olive oil in a large skillet over medium heat. Add the onion and saute, stirring occasionally, until brown and caramelized, about 10-15 minutes. If you use frozen onions, you may want to add a pinch of sugar to help with the caramelization process. 3. 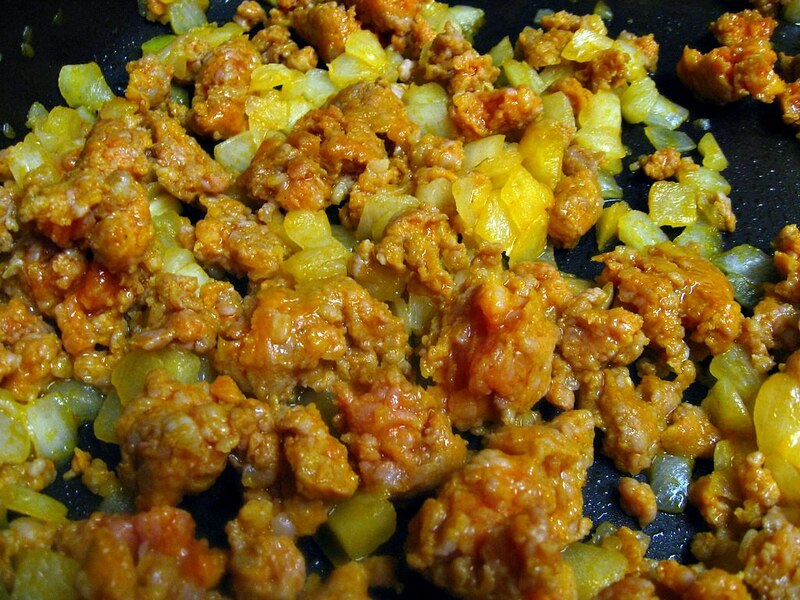 Add the chorizo to the skillet and chop with the back of a wooden spoon until broken apart. Cook until they turn almost completely brown, but not quite, about 5-7 minutes. 4. 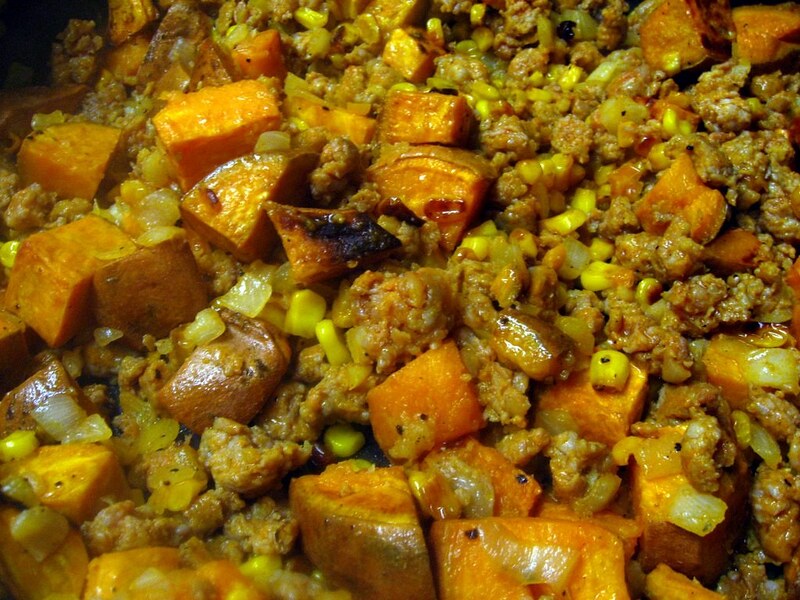 Add the sweet potato mixture to the skillet along with the juice of 1/2 a lime. Stir and cook until the chorizo is completely cooked, and then remove from heat. 5. 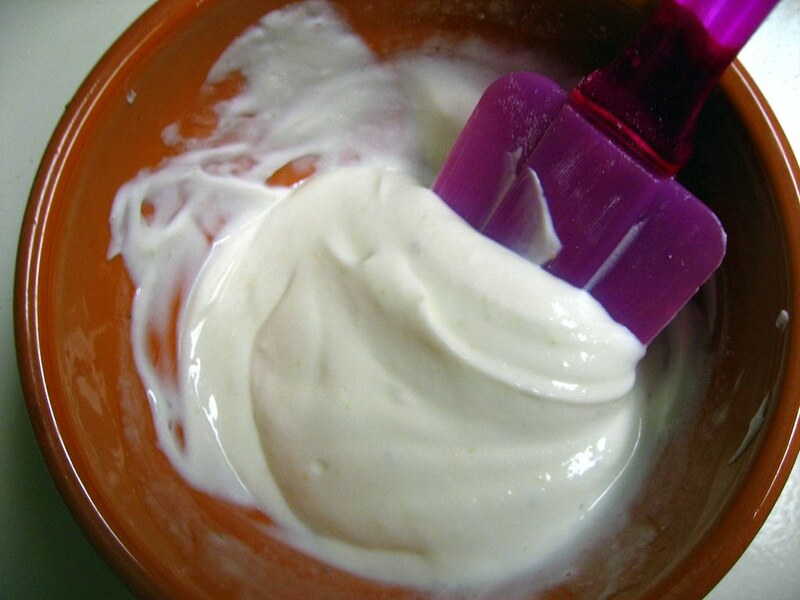 Combine the Greek yogurt, lime juice, and garlic salt in a small bowl. 6. 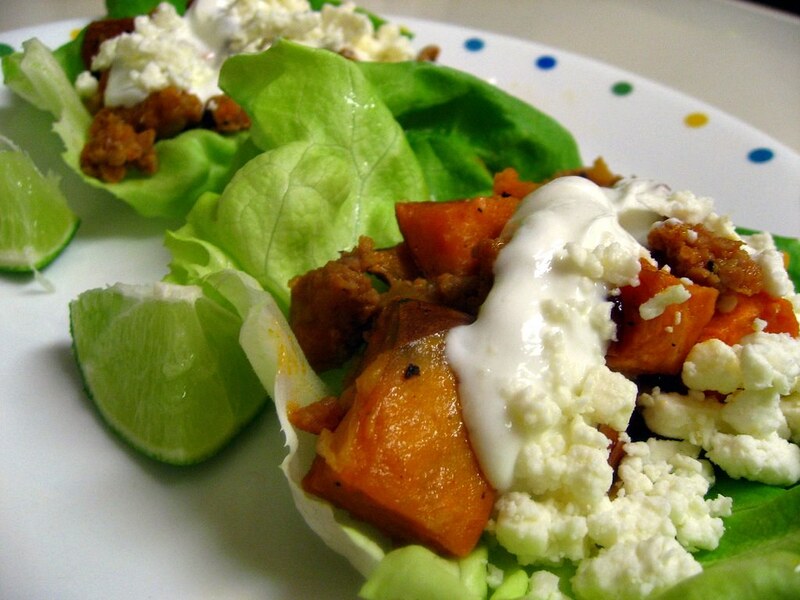 Assemble the wraps by placing a bit of yogurt in the bottom of a piece of lettuce, adding a few large spoonfuls of the filling, and topping with a few pinches of feta. This was very interesting and tasty! !